What do Tea Party rallies, Republican victories, climate-change deniers, Wisconsin’s anti-union push, and attacks on a cap-and-trade market for carbon emissions have in common? They’re all fueled in part by profits derived from Alberta, Canada’s oil sands. Those profits, flowing to a single company, are helping bankroll a libertarian offensive many observers think is shifting America’s political culture profoundly to the right. One of the central tenets of that campaign is a disbelief not only in the pressing risks of climate change, but that humans are even causing it. And it’s no exaggeration to say the roots of this campaign can largely be traced back to two powerful businessmen: Charles and David Koch. Together, America’s fifth-richest citizens — each worth $21.5 billion — own Koch Industries, a refining, pipeline, chemical and paper conglomerate that manufactures common household products such as Brawny paper towels and Stainmaster carpets. They’re also one of the biggest refiners of Alberta oil sands crude, handling an estimated 25 percent of all imports entering the U.S.
Never before in the U.S. has the oil sands industry enjoyed such direct political influence. Despite being America’s second-largest privately run company, Koch Industries was virtually unknown to the wider public until last spring. That was when Greenpeace released a report detailing how the conglomerate had funneled tens of millions of dollars between 2005 and 2008 to groups skeptical that climate change exists. Such activism is central to the Koch brothers’ hard-line libertarian ideology, which espouses a general distrust of government control. As more reports surfaced about Koch Industries — notably a lengthy New Yorker expose in August — the company’s growing political influence gained national attention. The brothers are now widely thought to be one of the driving forces behind the Tea Party movement, founding an advocacy group called Americans for Prosperity, which has provided critical funding and logistical support. Americans for Prosperity played a lead role in the Republican takeover of congress in last December’s midterm elections. Budgeting $45 million for political advocacy, the group ran hard-hitting radio and TV ads throughout the year extremely critical of Democrat congressmen, especially those who’d endorsed national climate-change laws. At the same time Americans for Prosperity helped coordinate and organize Tea Party rallies from coast to coast. Drawing upon an often confusing mix of grassroots idealism, government distrust and oil company mandates, the movement endorsed right-wing candidates across America, many of whome were elected to the House and Senate last year. Though David Koch denies any links to the Tea Party movement, an unnamed Republican insider quoted by the New Yorker thought otherwise. It’s highly probable that at least some of that money came from Koch Industries’ major investments in Alberta’s oil sands industry. Flint Hills Resources, a fully owned Koch subsidiary, operates a Minnesota refinery capable of processing 320,000 barrels of crude a day, about four-fifths of which is sourced from Alberta. Oil sands crude requires more energy to produce and refine than conventional oil, generally resulting in much higher greenhouse gas emissions. Refineries that depend on it are especially vulnerable to the types of clean energy legislation proposed in growing force over the past few years. Since then, fuel standards have become one of the fiercest battlegrounds in Washington’s war over the oil sands. Those laws, if ever enacted, could be equivalent to taking 30 million cars off the road by 2020, according to research cited by Barack Obama during his presidential election campaign. They would do this in part by discouraging American suppliers from using road fuels derived from Alberta’s oil sands and other high-carbon sources — precisely the type of fuels that Koch-owned Flint Hills Resources produces. For the time being, it appears the Koch brothers have little to worry about. Every attempt so far to enact a national low carbon fuel standard has been scuttled by intense fossil fuel lobbying, sometimes with the “support” of the Canadian and Alberta governments. And the last midterm elections produced a Republican stronghold generally hostile to the very idea that climate change is even a problem, much less one that should be addressed. Koch Industries wields considerable influence in this new political environment, especially on the powerful House Energy and Commerce Committee, where it contributed $279,500 to 22 of the panel’s 31 Republicans, the largest donation of any oil and gas player. Already, the Republican majority in the House voted to cut all American funding for the United Nations’ Intergovernmental Panel on Climate Change, one of the lead organizations studying global warming. And the House Energy Committee continues to push legislation that would eliminate the U.S. Environmental Protection Agency’s authority to regulate greenhouse gases. The rationale for such an attack was laid out in a Wall Street Journal op-ed last December, co-authored by Energy Committee head Fred Upton (a Michigan Republican), and Americans for Prosperity leader Tim Phillips. Last week, Democrats on the energy panel introduced amendments that would have forced their Republican colleagues to acknowledge that global warming poses major environmental threats. 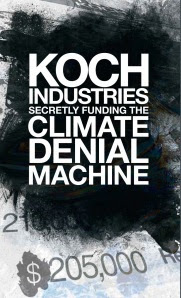 Koch Industries has not restricted its growing political activism to Washington. In Wisconsin, early versions of the state’s Clean Energy Jobs Act contained a low carbon fuel standard. But state policymakers dropped that provision last May, possibly a result of nearly $400,000 in Koch lobbying (not to mention pressure from the Alberta and Canadian governments). The Koch brothers appear to have also played an instigating role in the Wisconsin labor protests. Their company was one of the biggest funders of Republican governor Scott Walker’s election campaign. Walker, once in office, proposed spending cuts targeting union benefits and bargaining rights, causing a massive public backlash. Americans for Prosperity executives reportedly encouraged the labor showdown even before Walker was sworn in. The group is now working with policymakers and activists in Indiana, Ohio and Pennsylvania to slash their union spending. While all this was happening, Americans for Prosperity was coordinating a public relations campaign to kill cap and trade in New Hampshire. The Republican-dominated legislature had proposed a bill ejecting New Hampshire from the Regional Greenhouse Gas Initiative, a 10-state coalition attempting to combat climate change. During the lead-up to the vote, Americans for Prosperity paid for automated phone calls to citizens across the state, urging them to support the bill. It passed recently with a wide margin, effectively terminating New Hampshire’s long-term climate change plan. That’d be a huge win for Koch Industries, which wouldn’t have to worry about the high emissions caused by refining Alberta oil sands crude, at least until the next clean energy law was proposed. In the meantime, the Koch brothers hope to consolidate political control not just over Congress, but the White House too. Watch for their hand in the next presidential election, where the Kochs plan to raise $88 million to advance a conservative agenda. This entry was posted in Climate Change, Tar Sands. Bookmark the permalink.